Which watch strap should you be wearing? NOTHING quite whispers “debonair” like the deliberate coordination of trim and textures limning a gent in well-pressed, form-fitting clothes. The bare minimum used to be pairing one’s belt with the shoes. Dare we say: no longer? With accessories for men abound and customisation services becoming the norm, every element of your evening look is expected to play a role in the ensemble – down to the style of your coat buttons to the sliver of sock permitted to peek out from under ankle-length trousers. Of all the accoutrements to tweak, none is quite as impactful as the a bloke’s choice of watch strap. Beyond mere embellishment, our watch bands are load-bearing masterpieces engineered to deliver comfort while supplying style; the understated easel upon which your ticker is perched. At the same time, the band plays a huge role in confirming the formality of your outfit – it will not do to carry bright nylon to a black-tie event, for example. Recognising all the roles the modern man has to play, the top names in haute horlogerie have never shied away from spoiling us for choice. Here’s a guide to help you navigate the ins and outs of each type. For days where you have to don the corporate armour and cleave to strict dress codes, you’ll want the caress of timeless leather on the wrist. These straps come as a staple with most dress watches, often in understated tones of brown, black or tan, and are easily the most prestigious (and maintenance-heavy) of the lot. Even within this category, match the severity of your suit to the texture of your band – solid begets solid, while details like grain or stripes on jackets or blazers can be matched with croc or alligator, stitched or perforated leather straps. Alligator straps have been a perennial favourite. Pictured: A. Lange & Sohne’s recently-announced commemorative Lange 1s. Heck, you could bring out the rally-style bands if sports jackets are permissible. These daring straps sport multiple large holes right near the lugs, punched out for extra breathability around the wrist area. No prizes for guessing their origin – these were inspired by the racing gloves donned by early rally-car racers. Stainless steel bracelets (and watches) have come a long way. 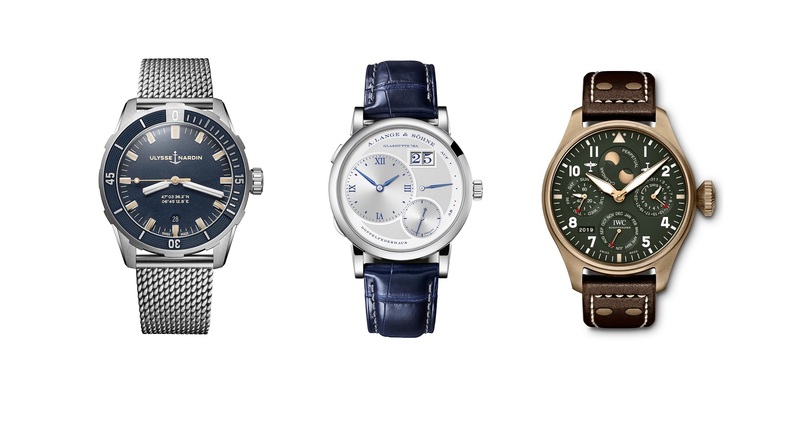 The weighty tickers – known for being nefariously hard and expensive to fashion, shrugged off the stigma of “tool watches” (good only for work or practical use, then swapped out later) and have become the top-performing category of timepieces today. Advancements in metallurgy and the meteoric rise of iconic pieces (such as the Audemars Piguet Royal Oak and the majority of Rolex inventory) helped reframe the perception of these watches. We’d argue much of the original allure still applies, though. Think a man of import with sleeves rolled-up and hardy watch ready to go, pitching in with his employees where necessary. The versatility of the steel watch, status icon that it is, makes it applicable in any variety of social settings, while its inherent hardiness make them all-weather companions. For that reason the style of the strap is largely a personal choice. Sure, there are some nuances – Rolex’s President bracelet is more pliant than the Oyster, for example, yet less durable due to more moving parts – but by and large these are consumer favourites for their immense practicality and history. For those open to wearing the hobby on the sleeve, many options await. The most ubiquitous of these – particularly in the dive watch category – is the straightforward rubber strap – often a silicone or NBR mix that even comes gratis with top-end purchases. Titanium and black rubber straps do go together seamlessly. Pictured: Girard-Perregaux Laureato Absolute chronograph. These relatively replaceable and waterproof bands let you convert your evening watch into your rough-and-tumble buddy on that next adrenaline-fuelled adventure. More importantly, they stand up to saltwater better than any other entry on this list, making them the go-to for maritime hobbies both above and below the water. That isn’t to say terrestrial activities don’t employ the durable straps – Rafael Nadal famously wears Richard Milles to the tennis court, so you can be sure rubber serves for even the most high-impact land sports. Conversely, the dulled and featureless bands don’t do you any favours at dinner parties, so switch out of this configuration if you want to do your ticker justice. Alternatively, turn to the increasingly popular NATO straps. These striped nylon bands offer up the perfect middle ground between battle-readiness and style – they’re easily washable and replaceable at relatively low cost, and can be switched up as your outfit of the day dictates. NATO straps have roots in the military, but aren’t actually related to the North Atlantic Treaty Organisation (NATO) – they’re simply a nickname given to special straps available to British troops beginning 1973. A NATO strap contributes additional grittiness to this already rugged Montblanc 1858 Geosphere. Then there are aviator’s watches, which more likely reflect every man’s fascination with aircraft and instrumentation than any real involvement. The corresponding aviator straps can be identified easily by rivets near the lugs. These are holdovers for when watches had to be bolted to the pilot’s hand, and are largely non-functional in the timepieces of today. As useful nowadays as teats on a man, but boy, does it complete the look. Pictured: IWC Big Pilot’s Watch Perpetual Calendar Spitfire. Practicality need not be exclusive with presentation. Straps like the mesh, Milanese and bund are all about providing suppleness around the wrist while preserving the decorum afforded by metal and leather. The first two can be loosely understood as bringing all the perks of medieval chainmail to the wrist. They require less care than leather, being somewhat impervious to rot and moisture, while delivering breathability in spades. They scratch less easily (or should we say, noticeably) than metal bracelets with large links, and are often lighter for it. In most modern renditions, Milanese mesh watches come with an adjustable clasp, so there’s no need to visit the shop when you’ve shed or gained some girth, and can even dictate where the watch sits on your wrist so that it peeks out just the right amount from under your cuff. Milanese mesh feels cool and lissom to the touch. Pictured: The Ulysse Nardin Diver 42mm with Milanese mesh option. The rare bund strap, on the other hand, is simply leather on more leather, tailored to spread out the caseback pressure that some find discomfiting. That isn’t to say it has no aesthetic purpose – watches mounted on bund straps double up as bracers, and can be matched with a denim jacket or streetwear elements to great effect. A custom-made bund strap turns this Rolex Submariner into a bracer-style affair. PHOTO: Leather goods artisans Eternitizzz Straps and Accessories. There remain smaller subcategories of straps we haven’t discussed. Some brands are even pioneering straps made of recycled material for packaging-free watches, and these actually look pretty nifty while broadcasting an environmental message. But whichever strap you opt for, remember the tenets: Match the formality of the event, accentuate the colours you’re already donning, and don’t be afraid to experiment. Your wrist will thank you for it.